Sigrid has worked in media, specialising in subtitles for over twenty years. She is client focussed and approachable with a can-do attitude, giving you the peace of mind that your project will be especially well looked after. With an immense knowledge base and an unmatched passion for learning new skills, Leroy has been an essential part of Sigrid’s team for over ten years. He handles all authoring, encoding and graphics projects, with sidelines in music production, coding for apps and clothes design! Ian is an expert subtitler with an impeccable attention to detail. 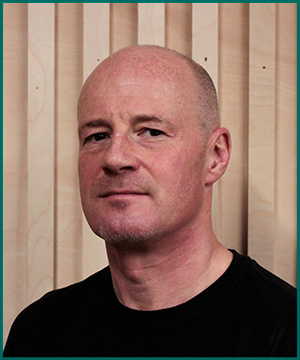 He has over twenty years experience in the industry with ten years as a key member of Sigrid’s team. Ian is fluent in German and French and is a passionate about live music. Eamonn is an expert subtitler who has worked in subtitling for over 15 years. He speaks fluent Japanese and specialises in hard of hearing subtitling, Japanese language projects and audio description. Eamonn is a martial arts enthusiast and an avid snow boarder. Nora is our resident film buff, with a passion for the kind of cult cinema titles we specialise in. With Nora as head of the quality control team you can rest assured your project will be rigorously tested until it meets her exacting standards. An audio visual masters graduate from Roehampton University, Maria joined us last year having previously worked as subtitling manager with a leading digital services company. Maria knows everything there is to know about DCP XMLs and is a great multi-tasker of work, kids and gastro-pub dining. Alan works with Nora to ensure all video and authoring projects will meet your exacting standards. He shares a similar passion for film, reviewing movies and conducting interviews for ‘Live for Films’, as well as attending film festivals and screenings. He regularly gets quoted on trailers, if Alan hasn’t reviewed it, it’s not worth watching. Bea joined us late 2018 from sunny Spain, having previously worked as content editor and DVD author for the independent distributor Cinebinario. She has been so engrossed in learning the ropes of Scenarist and our clients’ disc specs that she hasn’t noticed the absence of sunshine yet.